P600-Plus model features a premium titanium dioxide coated surface area, and the specially coated HEPA filter offers three times the photocatalytic capacity to deal with especially heavy concentrations of airborne chemicals. 20 watt 17" U shaped germicidal UV lamp. 30,000 um per sec squared. Sterilizes micro-organisms: antigens, pathogens and mold spores. Lamp situated in filter chamber so it kills organisms as they are trapped by the filters. Fitted with the new TitanClean photocatalytic oxidation reflector. 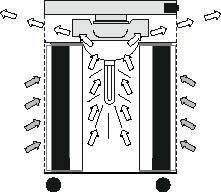 Other UV machines place the UV lamp in the air flow away from the filters. Microbes can escape back into the air. Refillable Carbon Option: Carbon can be refilled or replaced, your choice. The carbon filter life is typically 2 years, depending on use. HEPA Filter: True HEPA 40 sq ft: Warm rolled to prevent cracking, 10 pleats per sq inch maximizes filtration (other systems only use 6-8 folds). Spacers to make sure every fold filters. Typically lasts 5 years in regular use. Pre-filter: 570 sq in x 1" deep, vacuum from outside and replace every 12 months.